In the 10th century the land it stands on didn't exist, until a sandbank grew across the mouth of Breydon Water. In the 14th century it was one of the wealthiest towns in England, thanks to its proximity to rich fishing grounds. In the 19th century it became a thriving seaside resort, and in the 20th century declined. In the 21st century Great Yarmouth is attempting to reinvent itself more as a daytrip option, should you ever be in the area, or near enough. ✉ They could have called it The Museum of Herring, but that probably wouldn't have drawn the crowds. Instead they call it Time and Tide, because that's more alliteratively appealing, and because it conceals the fish bit. 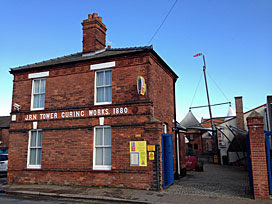 The museum opened in 2005 and is based in a Victorian herring curing works. By the time you leave you will know everything there is to know about this humble fish, and the people who caught it, and how it was preserved, and thankfully a lot of other non-fish-related things too. If they offer you an audio guide at reception take it. It's free, and many of the displays are only brought to life if you're listening to the informative, entertaining and occasionally sarcastic commentary. First up is a recreation of a Great Yarmouth Row, one of the hundreds of narrow alleyways that led down to the seafront, inhabited by local characters circa 1913. That year saw the high point of the Great Yarmouth herring industry, which is outlined in acceptable depth across the ground floor of the neighbouring building. Millions of fish were salted, speared and hung up to dry here, and the genuine smell of kippery smoke still permeates the 9m high chamber. Upstairs there follows a full history of the town, which is where the sandbank bit comes in, plus obviously a lot about boats and ships and all things maritime. I liked the Beside The Seaside gallery, remembering the heyday of the guest house landlady and the end of the pier show, and especially enjoyed the mechanical miniature pier complete with buxom spinning Britannia. My complete circuit of the museum took almost two hours, far longer than the narrow entrance had suggested. And then my Dad bought me lunch in the adjacent cafe, a classy but friendly affair with not quite enough smoked fish on the menu. 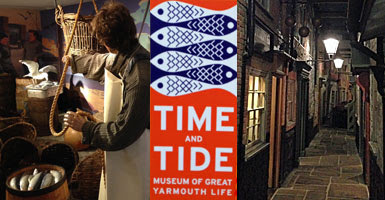 I can see how Time and Tide earned its nomination for European Museum Of The Year, alas losing out to a Heritage museum in Belgium. Recommended. ✉ The first week in March alas isn't high season on the Great Yarmouth seafront. Even if the weather's unseasonably fine there'll only be a few souls out and about, including those preparing for the new season and one suspicious looking family whose children really ought to have been at school. The Winter Gardens weren't living up to their name, and the amusements within the Wellington Pier were going mostly unspun. Still, where else can you get a tea for 79p, a coffee for 99p, and scone, jam, cream and cuppa for only £1.49? Alas there's no current admission to Merrivale Model Village, one of the largest in the country, complete with its own quarter mile of model railway. We were therefore pleased to see the Pleasure Beach open so wandered in, but the lack of activity should have been a clue, and we were swiftly ushered out by winter workmen who locked the gate behind them. March is still the season for repairing and repainting, so the candy floss booths still have undercoat showing, and the Log Flume is an undressed stack of metal chutes. One day soon the monorail will run again, and they'll close the gap to complete the Scenic Railway, the only such operational wooden rollercoaster in the UK. It looks incomplete from the beach, a lot of the vertical planking removed to facilitate repairs, but then there's nobody on the beach to notice either. Best come back in the Easter holidays when hibernation ends, and Great Yarmouth wakes up for another hopeful summer season. ✉ There are several Nelson's Columns, the global icon in Trafalgar Square being the most famous, but there's a lesser known alternative in Great Yarmouth. Norfolk's monument is five metres shorter, but also 25 years older, erected from public funds as an elevated tribute to the great Admiral Horatio. Great Yarmouth was selected as the most appropriate place in the county, thanks to its naval connections, and the tower went up on the South Denes between the docks and the military barracks. It looks a mighty stupid location today. The navy's operations are long gone, and the southern half of Great Yarmouth's sandy spit is now given over to industrial use. Walk towards the column, more correctly known as the Norfolk Naval Pillar, and the residential streets cease just beyond the Pleasure Beach. It takes some nerve to keep going past builders yards, Indoor Karting and storage depots, but have faith. A small square with metal railings survives within the estate, and within this rises an imposing Doric column. That's Britannia on top, not Nelson, and she's facing inland which some say was a ghastly error on the part of the designers. Beneath her are six supportive caryatids, and below that the names of Nelson's four greatest victories, one on each square face. Come on a summer Sunday and you can climb the 217 steps to the top, but only two people at a time because the spiral staircase is particularly narrow. Come on a March weekday and all you can do is look up and admire, and get stared at by the lads on fag break at the microelectronics firm across the square. It really is a comedown for the great Horatio, his monument ignored by 99% of visitors to the town because it's down the far end where none of them ever need to go. 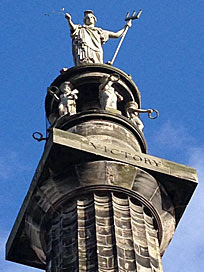 But a recent restoration gives hope that Nelson's Other Column may still have its victory.